Are you looking for the perfect handmade apron to get your craft on? Or to do some house cleaning (well maybe that can wait)? I have the super creative lady that I would like to you meet. Her name is Cindy with Retro Revival. 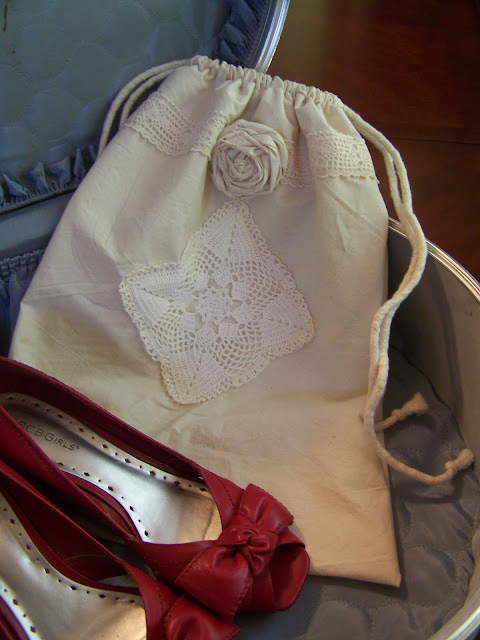 Cindy makes handmade aprons and many other clever useful items. Cindy from Retro Revival and I are hanging out today. them for US here in blog land. I can’t believe it, because it’s flown by so quickly, but almost two years! After 25 years as a corporate Human Resources executive, I am now truly pursuing my passion and have never been happier. Tell us what you picture and dream for the future of your business. 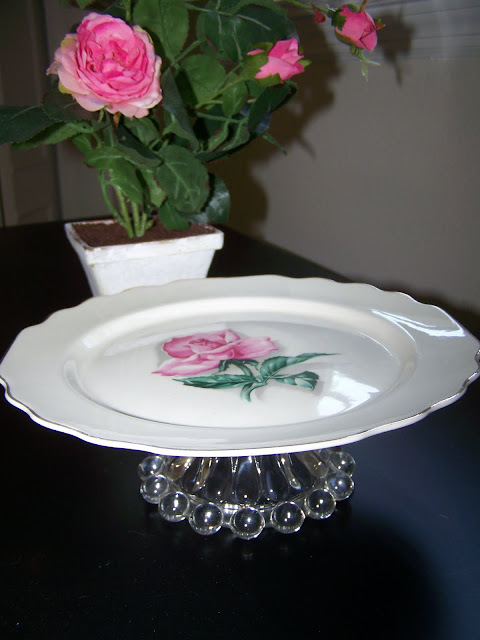 My goal is to create the most charming and authentic retro accessories and home goods on the web! And my dream is to rid the world of those ugly, plastic shower caps ~ ha! Seriously, I hope and dream that all of my handmade products will be worn and used with pride. What tasks do you most and least like about your work? I really don’t dislike anything about my business, even the little things like addressing and shipping packages ~ all of my tasks, big and small, give me satisfaction and a sense of accomplishment. As for what I most enjoy…probably designing my aprons. I could mix and match, sketch and play with fabric all day long and I literally dream about it some nights! Oh, and interacting with my customers! I am a lucky lady to get such sweet and happy feedback, often unsolicited and with photos, from my buyers. I’ve been designing and sewing since childhood, first by hand, before my father gave me a sewing machine for Christmas when I was about eight. I started out making Barbie clothes (my Barbie was the best dressed on the block ~ ha!) and over time, graduated to accessories, like purses, then home decoration like draperies and pillows, then quilting, and all manner of gifts for family and friends. Over the years, my sweet family and dear friends encouraged me to turn my passion into a business. My sewing experience and craftiness, combined with my obsession with vintage textiles, led me to design my first products, the shower caps and aprons, mixing the domesticity of the 1940’s and 1950’s for today’s 21st century woman. My demographic is primarily women ~ of all ages! 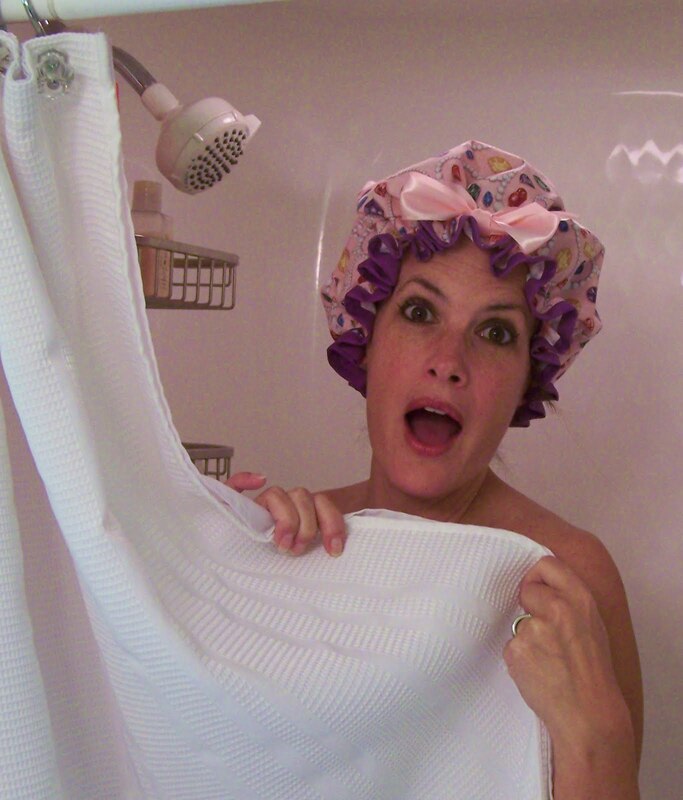 There is no happier customer than a curly-haired woman who struggles with keeping her tresses frizz-free and who discovers my shower caps! I’ve had women literally throw their arms around me and thank me for them ~ how great is that?! 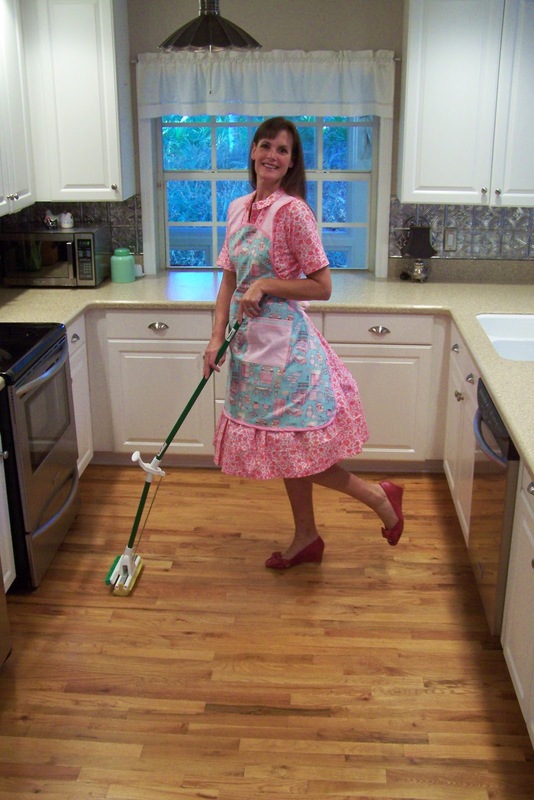 My apron buyers are happy people too, and often share memories of their mothers or grandmothers wearing aprons. About half of my apron customers buy for themselves and the other half buy for their friends and family members; they’re great for holiday gift-giving, bridal showers and birthdays. Whether buying for yourself or someone else, and whether a microwave queen or aspiring chef, my aprons flatter every figure! Tell us about the product that you are most excited about offering right now? 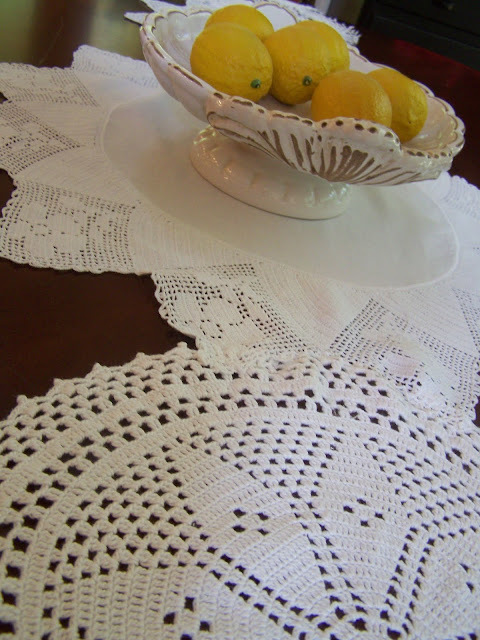 I am most excited about one of my newest products, my vintage doily table runners! Over the years, I’ve scoured the States looking for hand-crocheted doilies and now I am using my collected stash, carefully hand-stitching them together into beautiful table runners. They’re perfect for everyday use or for special occasions like weddings, showers, holidays or parties! What three things can always be found in your refrigerator? No because I have Twyla, though my sweet, ornery beagle rarely responds! If you are not already following Cindy’s blog? I would encourage you to do so; she is very creative, funny and a wonderful lady. Everyone needs a little relaxation and lavender is perfect to help you kick back with all of it’s aromatherapy benefits. 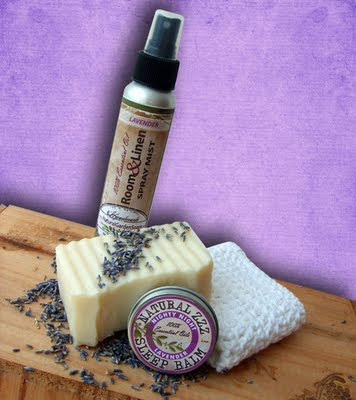 This month I am giving away a “Lavender, Lavender and more Lavender” natural combo set. I am a loyal follower and have bought her products. Cindy, I am so Thankful that we met and became friends. You are the BEST! Great getting to know you a little more Cindy!! I am a follower of both of ya'll. Great blog post Paula! :) I love the shower caps! They are adorable :) Great interview!